The MR1900-CH provides a high-speed intelligent link between all your local Wi-Fi and Ethernet devices and your Charter cable modem. Featuring Wi-Fi Power Boost, the MR1900-CH delivers very high speeds and extended range even when you're far from your router of surrounded by Wi-Fi noise from neighbors. The MR1900-CH connects via AC1900 dual band Wi-Fi or Gigabit Ethernet to all your HDTVs, smartphones, game stations, computers, tablets, and more. It uses high-performance power amplifiers and a separate antenna for each of its 6 Wi-Fi channels, so Wi-Fi power is very close to the legal limit in the US. In addition, implicit and explicit beamforming with Anybeam targets the Wi-Fi signal to each of your Wi-Fi devices resulting in blazing fast Wi-Fi speeds and extended range. Netflix, YouTube, Amazon, and other video streaming services can be delivered to many devices at the same time through the router's 4 Gigabit LAN ports or through Wi-Fi. Router features include easy setup with any Charter modem, a user-friendly firewall, IPv4 and IPv6 support, parental controls, guest network capability, LED stealth mode, and more. The MR1900-CH has both a USB 3.0 port and USB 2.0 port for network access to Flash drives or other USB memory devices. You can monitor and control the MR1900-CH with its easy smartphone app or any Web browser. The MR1900-CH features Motorola quality, a 2-year warranty, and friendly, professional support from the USA. 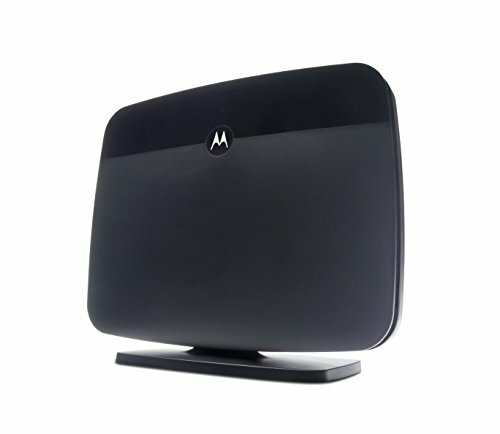 Best of all, the MR1900-CH offers the value, performance, and attention to quality that make Motorola a leader in Wi-Fi and Internet access products. Adds a wireless or wired link for shared Internet access between all your local Wi-Fi and Ethernet devices and any Charter cable modem.. Featuring Wi-Fi Power Boost, the MR1900-CH delivers very high speeds and extended range even when you're far from your router of surrounded by Wi-Fi noise from neighbors. Note that this router does not have a built-in cable modem or other type of modem. Connects via AC1900 dual band Wi-Fi or Gigabit Ethernet to all your HDTVs, smartphones, game stations, computers, tablets, and more. Easy setup with any Charter cable modem. Uses high-performance power amplifiers and a separate antenna for each of its 6 Wi-Fi channels, so Wi-Fi power is very close to the legal limit in the US. In addition, implicit and explicit beamforming with Anybeam targets the Wi-Fi signal to each of your Wi-Fi devices resulting in blazing fast Wi-Fi speeds and extended range. The Web, Netflix, YouTube, Amazon, and much more can be delivered to many devices at the same time through the router's 4 Gigabit LAN ports and through Wi-Fi. Router features include a user-friendly firewall, IPv4 and IPv6 support, parental controls, guest network capability, LED stealth mode, and more. The MR1900-CH has both a USB 3.0 port and USB 2.0 port for network access to Flash drives or other USB memory devices. You can monitor and control the MR1900-CH with its easy smartphone app or any Web browser.